What’s the best cheap smart watch? | Galaxy Watch Active Is The Answer. The Galaxy Watch Active, is a great gift for those who like fitness bands for tracking their daily activities, but they don’t feel comfortable wearing them, because, they don’t look as stylish as they would. 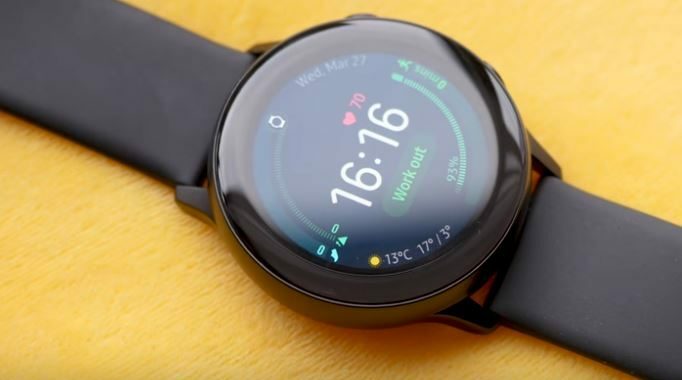 And it can be an obvious solution for those who want jump to the smartwatches market, but they feel that these bulky smart pieces still not capable to give their wrists a plus in the fashion side. 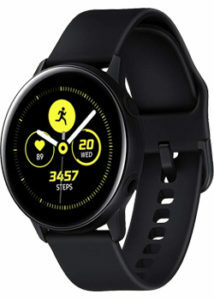 What you need to know is that the Active version, is the same as Galaxy watch that has been launched a few months ago. 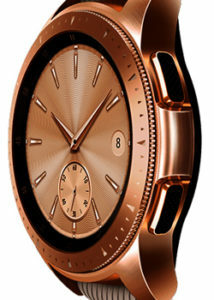 But this time with much smaller case and eliminated rotating bezel and of course a significantly reduced price tag. This is a very nice and attractive watch that doesn’t weigh more than 25g without the strap, with a ditched rotating bezel, and a nice thinner and slimmer design. The active is still a pretty good experience, it’s got two buttons on the right hand side, as well as a nice responsive touch screen, even with wed hands or when it’s splashed accidentally. The fact that you can pair this watch to both of Android And iOS makes it much more recommended for any smartwatches lover. Although, there are some important differences between pairing it to both of these platforms that actually has to be enhanced, to get the best of the fitness potential of this device. Pairing it to Android phones, will allow you to respond to text massages using voice dictation, a wide selection of emojis and write on the screen using its built in keyboard, or just select from the list of predefined responses. Although, there is a microphone for dictation and BIC speed, the Galaxy watch active doesn’t feature a built-in speaker, which means, you won’t be able to make calls directly from it. But when it’s paired to an iPhone, it like a kind of half paired. Because, it actually allows you to dismiss from your wrist, but you won’t be able to respond to text. And you can choose to answer or decline a call from the watch itself, but you’ll need to speak on your phone. And with all that’s been said: it still a good Smartwatch experience. With Android you’ll be able to purchase paid Apps and watch faces, with iOS you won’t. But Spotify is available on both iOS and Android, with a reasonably quick downloading rate when it’s connected to Wi-Fi. And you can pair your earbuds or Bluetooth speaker with both Systems without any issue. Sleep: An addition to that 48 hour in single charge, the galaxy watch active features the automatic sleep tracking. And if you have some bad experiences wearing that big and bulky watches while you sleep, don’t worry! Because, sleeping with the Galaxy watch active is completely a different experience. It’s very thin and light and it gives you all the important data that you need to track your sleep. Like the time you spend in deep sleep, in light sleep, and in REM, which is the time you spent in dreaming. All these info help people to well understand the benefits of the good sleep for their bodies, and go to bed based on those data. Having a good sleep, will definitely affect your entire day. Workouts: This watch comes with 39 built-in workout profiles including standard stuff, like running, cycling, walking, and swimming. all of which have indoor and outdoor profiles and quite a few others that are going to be available. and will go deep into each of them the coming articles. This is 2-days battery life watch. You can wear it for the full of two days in normal use, in fact I’m getting more like a day and a half out of it even while GPS for about 50-60 minutes per day. Even if you activated the always-on option in the setting which dims the screen, it actually didn’t seem to affect the battery life all that much. There are two different charging ways, one is by using the ordinary magnetic charger that comes in the box, which takes about 50-60 minutes to get your watch to its full charge. And the other way, is by using the power-share feature that’s in your S10. Finally: With all what has been said and an easy replacement band, $200 price tag, a stunning and light weigh design, the Galaxy watch active is the best cheap smart watch in the market right now. Bluetooth 4.2, Wi-Fi b/g/n, A-GPS, NFC (No MST). 1.1-inch 360 by 360px AMOLED screen (40mm watch size), Gorilla Glass 3. IP68, MIL-STD-810G certified, 5ATM water resistance. 4 colors: Silver, Black, Sea Green, and Rose Gold.